Behind what scout hides the wendigo? The WENDIGO, the evil creature in the heart of ice, has the appearance of one of the scouts of your patrol. Every night he moves to remove one of yours. Join forces, be observant and concentrate on spotting it before it's too late! 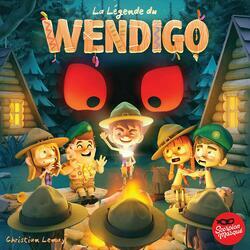 All players play together little scouts except one who plays The Wendigo. In front of you are Scout tiles lying on the table. The night comes and all the scouts turn around (to go to bed). Meanwhile, the Wendigo replaces one of the Scout tiles with the same Wendigo tile. The other players can then watch the board again for 45 seconds. Night falls again, and while the other players have their backs turned, The Wendigo steals one of the scouts to replace it with his tile. On daybreak, all the other players turn around and have another 45 seconds to find out which scout has moved and therefore find the Wendigo.